The Invacare all-in-one steel commode offers consumers the comfort and stability they need with its 16-inch wide seat, durable armrests, and removable backrest. And with its adjustable height and 300 lb. weight capacity, the seat accommodates most individuals. 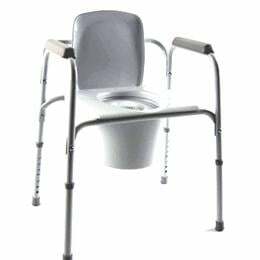 The versatile steel commode can be used bedside or with the backrest removed, it can act as a toilet safety frame or raised toilet seat. Width between arms : 19"
Seat-to-floor height adjustment range: 16" to 22"
Overall height (varies by seat-to-floor height): 23" to 29"
Product weight : 12 lbs.